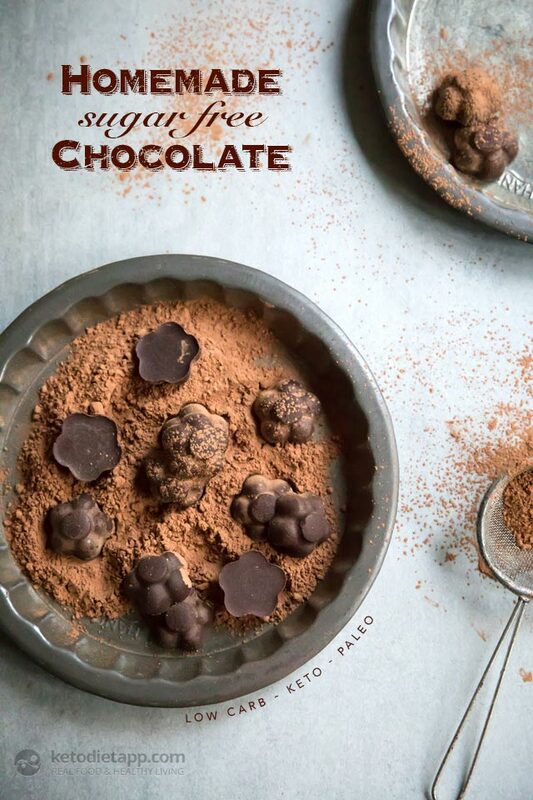 This recipe is one of the sugar-free & keto essentials from my Fat Bombs Book. 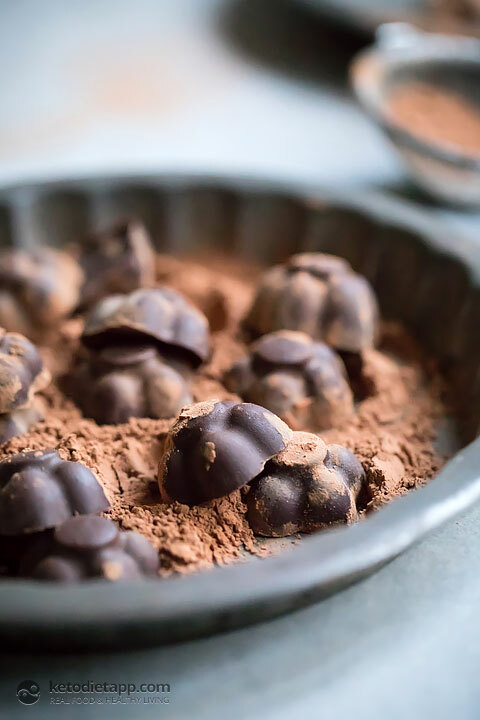 For those new to the keto diet, fat bombs are delicious bite-sized low-carb snacks. This chocolate is made with a few simple ingredients: cacao butter, cacao powder and low-carb sweetener. You can find this recipe on pages 34-37 together with three more variations of dark and white chocolate. 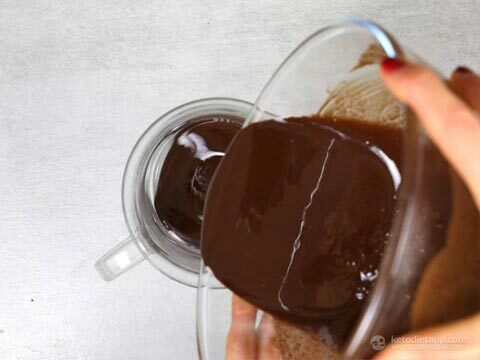 Melt the cacao butter in a double boiler, or heat-proof bowl placed over a small saucepan filled with 1 cup of water, over medium heat. Make sure the water doesn&apos;t touch the glass bowl — it should only be heated through the steam. Remove from the heat and set aside. Stir in the sunflower lecithin (if using), cacao powder, Erythritol, vanilla, and salt. If you want a sweeter taste, add the stevia. Pour it in candy molds or chocolate bar molds. Let it sit to harden at room temperature or in the refrigerator. Once hardened, remove from the molds and keep in an airtight container. Store at room temperature or refrigerate for up to 3 months. Enjoy! Hi Lara, this happened to me too! You really need to use "powdered" sweetener (confectioner's type) because otherwise you will have crystals that won't dissolve. You can use granulated and "powder" it in a food processor or a coffee grinder. Hello, thank you for this recipe! I used Allulose and the flavor came out great! The first time making it the Allulose was a little gritty so I just made a batch were I put the powdered Allulose in with the Cocoa butter while it was still on the stove to see if that would help dissolve it. I have a question though, I chopped the bars I made into chunks to try and use for a cookie recipe, the chocolate completely melted and the chunks didn't hold their shape, can you suggest a way to resolve this? Thank you! Hi Mark, I'm sorry it didn't work in a cookie recipe! To use this chocolate in a cookie (or anything that requires baking), you will need to use a stabiliser such as sunflower lecithin (see note that I just added). I hope this helps! Step 3: " and our it in candy molds or chocolate bar molds. " I assume that "our" is supposed to be "pour." Anyway, I hope to give this recipe a try. If it goes well, I'll be packing most of the first batch off as a birthday present for a relative. Love these chocolates. I'd like to know how you come up with the Nutrient Values. I'm using Cronometer and I've noticed several recipes, when I add them there, arrive at much different values, particularly the carbs and fibre which Cronometer always shows as higher. Don't like that! What do you use? Thnx. Hello! Thanks for this nice, straightforward recipe! The flavour is great. I was wondering if you might have any advice for me. I find my chocolate turned out horribly gritty. I used powdered erythritol (Sukrin brand) and added it using a sieve to ensure it was nice and fine and there were no chunks. Any ideas why this is happening? Thanks so much! Hiello Mia, I'm sorry to hear that! Powdered erythritol or swerve are good options but there is some crystallisation, especially after chilling. For really smooth chocolate it's best to use liquid stevia (but there is some aftertaste) or powdered allulose (no aftertaste). I hope this helps! Hi - I’m quite surprised at your proportions. I’ve been making chocolate like this for a few years and any recipes I looked for initially used the same amount of cacao butter and powder. Is there a reason why you use a (more or less) 1:4 ratio? Is this what constitutes natural cacao liquor? Hi Allison, I think it depends on your palate. I like this ratio but you could add more cacao powder, or use less. 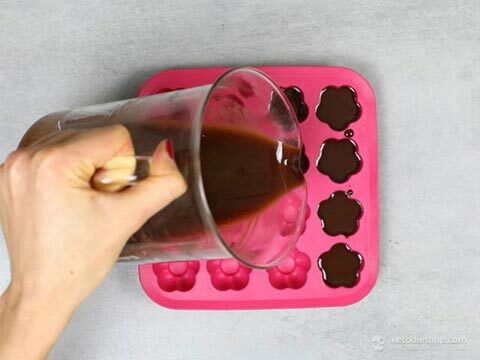 I think that using the same amount of cacao butter and cacao powder would make the chocolate too strong/bitter but again it depends on your palate. Also, more cocoa powder would add carbs so it depends how you are planning to use the chocolate. 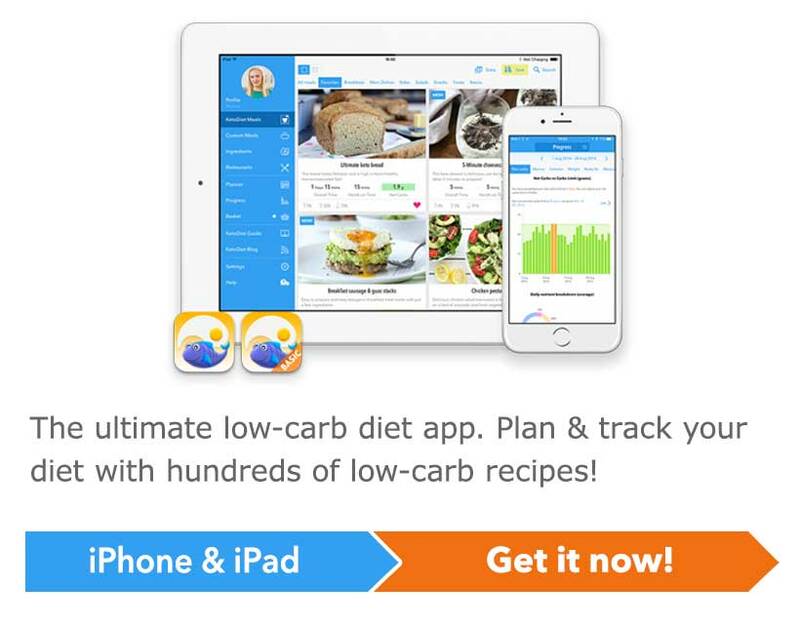 Hi...just came across your wonderful website while looking for keto recipes!! I have a query though - can we substitute cacao powder for Hershey's cocoa powder?? Thank you...n keep up the great work! Thank you for your kind words! 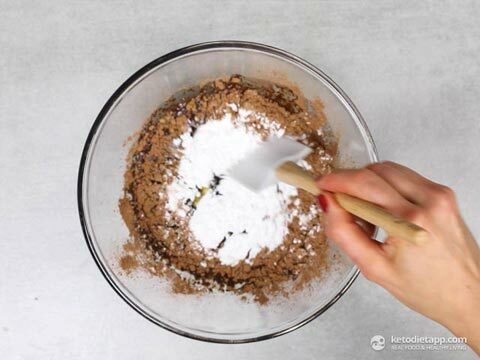 Yes, you can substitute cacao powder with unsweetened cocoa powder (Dutch process). I hope this helps! Thank you very much for sharing these lovely recipes. The recipes are simple in ingredients and easy to follow. Unfortunately I react to all sweeteners and have gone used to food without sweetness. How much cacao powder do you think I should reduce to so that the chocolate isn’t too bitter? Many thanks! Hi Vini, that's hard to tell but I'd go by taste and add cacao slowly by tablespoons, mix and taste. Mine separated into layers whether I cooled it on the counter, the fridge, or the freezer? I'm not sure why that happened - did you use any substitutes? 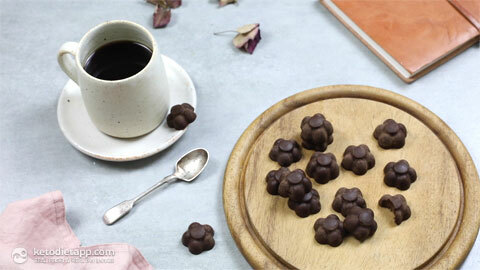 Hi, I was wondering if these chocolates could be used in baking, such as in a chocolate chip cookie? Thanks for the recipe. Question what % would you say this recipe yields? Just wondering if we can use this in any of your recipes that call for 85 or 90% chocolate? Hi Mark, this would be the ideal chocolate for any of my recipes as I use 85-90% chocolate in most of my recipes. Some recipes require 100% chocolate which does not contain sweetener but it always depends on your preference. Do you have to use erythritol or can you use stevia powder? I'm not a fan of the erythritol. Any sweetener (stevia, erythritol, swerve or monk fruit) will work. If you use stevia powder you'll have to use just a pinch as it's very sweet. I have to know if this comment is visavle to only you or if it is published on you blog/web site? I was looking for a very simple fat bomb I could "grab and go" for the next 45 days. As my daughter says "you filled my bucket". Could you use real butter like Kerrygold? Also, I use Pyure brand stevia (an all natural sweetener), could I sub that for the Swerve/Erythritol? I love your blog, I spend way too much time looking at and making recipes off of it! I used to be Paleo but switched to Keto and am in my third week. Fat bombs are my favorite treat, I made the porridge this morning and it was to die for! 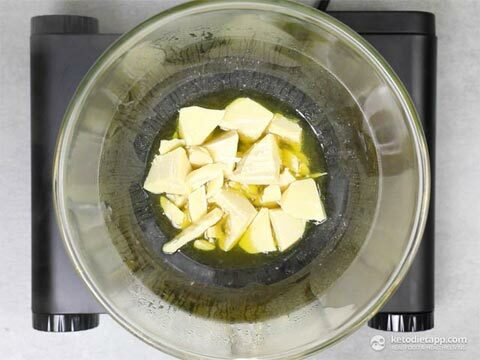 Regular dairy butter and even coconut oil would work instead of cacao butter but only if you keep them in the fridge (they would melt at room temperature). With dairy butter they will last for up to a week. Martina There are 2 versions of Pyure available, one is a baking blend and contains maltodextrin. the other is only stevia and erythritol. Thought you should be aware of this before telling others not to use it. Thank you Jacqueline, I was not aware - it was the first product I found and didn't think of going though all of their sweeteners. Pyure also has one that is organic Stevia extract (REB A) with no other ingredient. It is a fine powder that is very sweet, only a dab is necessary.